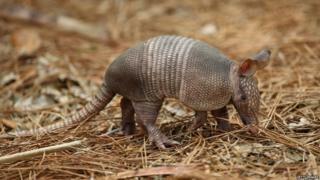 A man from Texas has been wounded after a bullet he fired at an armadillo ricocheted and hit him in the head, the local sheriff says. The shooting incident took place in the Marietta area of East Texas. Three shots were fired and at least one ricocheted off the shell. The gunman was treated for a minor injury to the jaw, USA Today reports, but the small armoured creature has not been found and its fate remains unclear. Cass County Sheriff Larry Rowe told Reuters that the shooter opened fire in the early hours of Thursday morning when he spotted the armadillo on his property. "He went outside and took his .38 revolver and shot three times at the armadillo," Mr Rowe said. "Karmadillo!" tweeted the comedian and animal rights supporter Ricky Gervais. Thursday's incident is not the first armadillo bullet deflection to end in a human wounding in the southern United States in recent months. In April a Georgia man injured his mother-in-law when a bullet ricocheted off an armadillo, "hit a fence, went through the back door of his mother-in-law's mobile home, through a recliner she was sitting in, and into her back," local TV station WALB News reported.